Jenna McPherson joined Brudvik Law Office in 2016. During her time in law school, Jenna served an externship at the North Dakota Supreme Court and worked as a law clerk at Brudvik Law Office. She joined Brudvik Law Office as an attorney in May of 2018. Jenna focuses her practice on Probate, Estate Planning, Collections, and Criminal Defense. Jenna grew up in Rogers, Minnesota and moved to North Dakota in 2010 to pursue a degree in criminal justice. In 2013, she graduated from North Dakota State University with a bachelor's degree in criminal justice with a minor in political science. 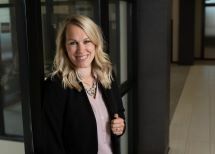 Jenna continued her education at the University of North Dakota School of Law, earning her Juris Doctorate in 2017. Jenna and her husband live on a farm in rural Cass County. In her spare time, Jenna enjoys being with family and friends and spending time at the lake.